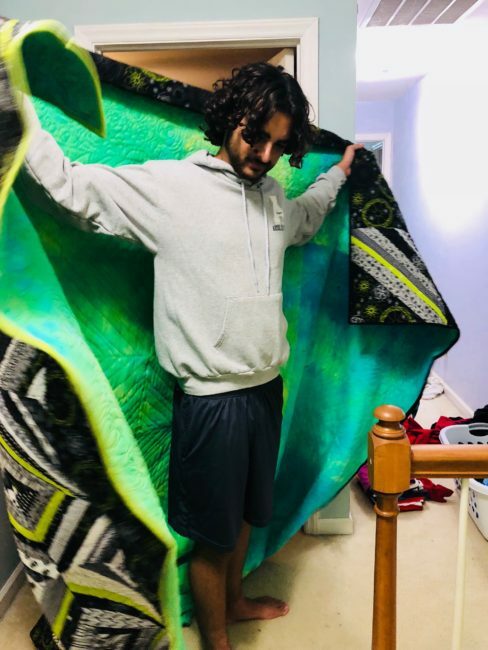 lyric made a bed quilt? It’s a miracle! So, now four out of five of my kids have quilts for their beds. The first got hers at age two, the second at age 8. Both are still in heavy use but neither are dressing a bed. This kid got hers two years ago. I’ll tell that story soon. 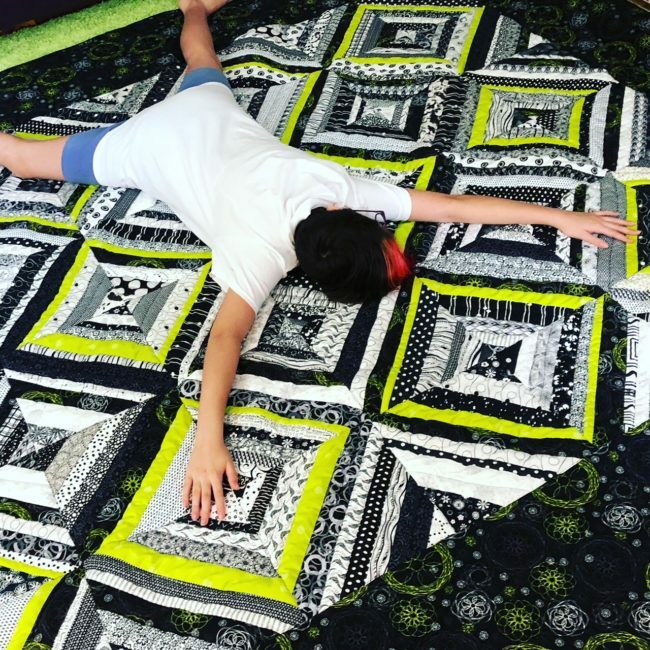 This quilt was started quite a few years ago as a project to teach my son to sew. Both of my boys started quilts at the same time. I cut a muslin square then they just sew strips and flip them. Start in the middle with a green strip and work your way out. Ethan got about six blocks in and was done. That’s fine. The point was to give him enough experience on a machine that if he ever want to touch one again he knows he can do it. Mission accomplished. 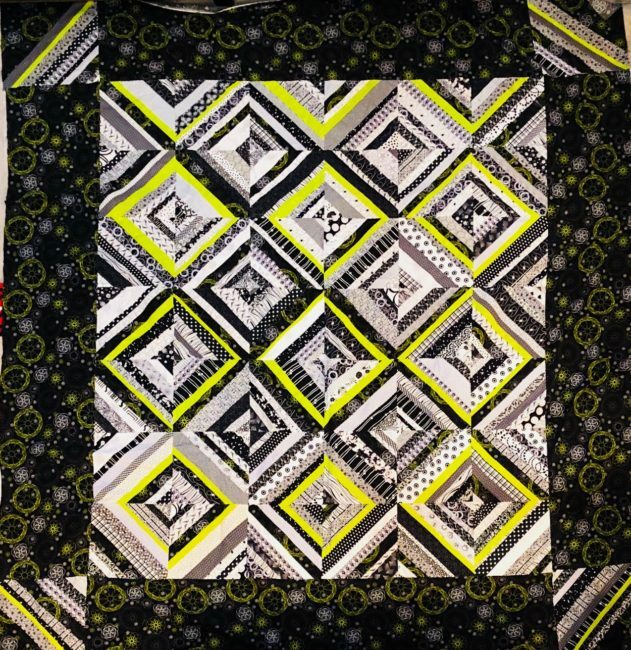 I finished up another six blocks or more then put it away. Life. Deadlines. All that stuff. I imagined I would finish it last year for his birthday. Didn’t happen. im telling you friends. If you want to get things done join a quilt bee full of ladies who love to sew. And who have time to sew. Kathy is a miracle worker. She put the rest of blocks together. During our quilt week at the beach I got the borders thrown on. Becky has a long arm and let me use it to quilt this monster. 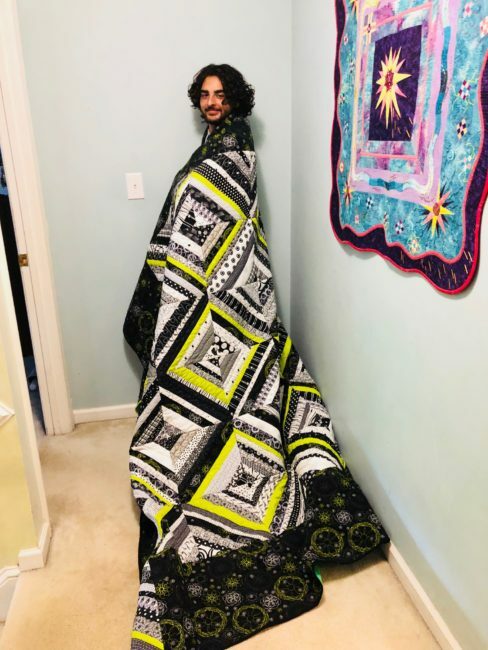 The thing is queen sized (no, I didn’t measure a single thing during the making of this quilt.) it is also ridiculously heavy with a flannel back, wool batting (which is not heavy) and an extra layer of muslin as the base for each of those blocks. I got the monster quilted in about seven hours. Wow. I bound the whole thing by machine. No hand work here. Seeing him happy with it, dragging all around the house to wrap up in is gratifying. Worth it? Yes, thank you. Cool – super cool seeing him loving it in many ways! Love it! Good for you!